You will be treated by one of our professional registered massage therapists. Learn more about our treatments below. We encourage you to check with your health care plans for coverage. If you have Blue Cross, did you know we direct bill Blue Cross for massage therapy treatments? This full body Swedish massage is an Urban Retreat staple. Your therapist will adapt their eclectic massage techniques for your special needs to provide a deep tissue massage, relieve muscle tension, increase circulation, and promote relaxation. This penetrating heat massage uses hot stones which allows for a deeper relaxation combined with Swedish massage. For ultimate relaxation. The Spa Massage is the ultimate way to unwind – complete with essential oils, hot towel service, face massage with Dermalogica product and steam room. Enjoy a relaxing side by side massage with your loved one. Treat him or her as a gift on your anniversary, Valentine’s Day or other special occasion, or come anytime for a pampering together! What do I wear while getting a massage? It all comes down to what you are comfortable with. Most people will either leave their underwear on while the rest prefer to be in the buff. It’s all up to you and your comfort level. How long does it take to get a massage? We offer 30, 45, 60 and 90 minute massages. The average person usually gets a 60 minute massage. The more work you need, the longer it will take. For a typical relaxation (full body) massage, it takes 60 minutes. Will I be covered up during my massage? Yes. The only part of your body that isn’t covered up is the specific area that is being massaged. What is the difference between a relaxation and a therapeutic massage? The easiest way to describe the difference is how much pressure is being applied. 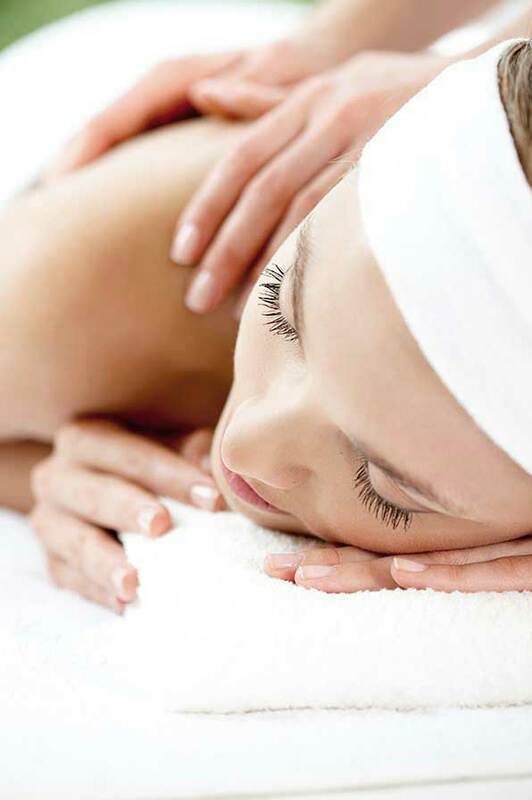 During a relaxation massage the pressure is superficial which helps to increase circulation and lymphatic flow. This smooth and calming type of massage in most cases is done to the whole body (back, legs, feet, arms, shoulders, neck, face, head and sometimes the stomach to help digestive disorders). With a relaxation massage you will feel very relaxed afterwards.When it comes to a therapeutic massage, the pressure becomes deeper and can be more intense. Also, more techniques are used to help release tight muscles. Keep in mind that when working deeper into the muscles you may find some soreness the next day.So if you are in need of getting rid of some general aches and pains, a therapeutic massage may be what you are looking for. Otherwise if you just want to relieve some stress, check out our relaxation massage.